The Vango Icarus 500 is one of Vango’s most popu lar family tunnel tents due in no small part that it represents great value for money. 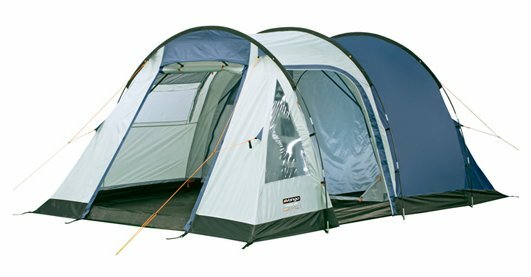 This flexible tent is available in two sizes, the four man Vango Icarus 400 and the 5 man Vango Icarus 500. So lets see what makes this tent such a good buy. The Vango Icarus 500 & Vango Icarus 400 offers weekend campers a tent which is quick and easy to pitch, a good size living area and flexible sleeping arrangements. Once you familiarise yourself on how to pitch the Vango Icarus you’ll have the tent up in no time, in about 10-15 minutes. The flexibility of the sleeping area of the Vango Icarus 500 allows for it to be divided into two smaller sleeping pods or used as one large sleeping pod. Also the living area of the Vango Icarus is large and can be extended using a canopy. The fire retardant flysheet of the Vango Icarus 500 has a hydrostatic head rating of 2000mm, which means that it will cope with pretty poor weather conditions. The fabric is also treated so that it will not suffer from UV deterioration as badly as some other tents manufacturers. Another design feature of the Vango Icarus is that it is well ventilated which means that when the sun is out it is cool and when it is raining condensation is kept to a minimum. The clever people at Vango have designed a system called TBSII, Tension Banding System The Vango Icarus being a large tunnel tent can some times caught by side winds and sway about. The TBSII supports and stabilises the hoop structure by creating an internal bracing system for each hoop. If like me you don’t like spending ages putting up a tent just to bring it back down two days later then you’ll like the Vango Icarus. We do like how easy it is put pitch, made easier due to it only three poles, which makes this an ideal weekend tent. Other features we like are the storage pockets which are great for storing essentials like toilet roll and the like. Vango Icarus 500. So lets see what makes this tent such a good buy. The Vango Icarus 500 would suit couples or small families although if you didn’t take too much stuff I am sure this tent would be comfortable for longer breaks. well this tent is ok but after a first night of wind,one then two of the centre brace poles split(this was a brand new tent) then later in the week the inner pod zip ripped from the fabric, vango were great and gave me free poles and some thicker decent steel pegs which didnt bend on hitting in the ground,why they dont give you these as standard with a tent i dont understand, apart from that the tent in roomy and the price is good and i would give it 5/10 as i have only used it once so dont know how many more trips it can handle . Yeah, David we get nothing but good feedback about the customer service of Vango – must be something in the Scottish water. I agree with about the poles, sounds a bit of a no brainer to me! I have been using the Icarus 500 for 3 years now and can not report a single thing wrong with it. We use it for our 3 day camping trips and on average go away about 4-5 times per year. It’s sleeps our family of 4 comfortably and it’s a no frills, good family tent if you’re introducing yourself to the great outdoors. I can erect the tens on my own as it only has 3 poles and generally it’s ready for occupation within 15 minutes (that’s pegged down and guide ropes in place). The internal lay out is fine with inner compartments which can be zipped up during the day to keep out the insects and a handy little hanging storage part for the essential smaller items. If you are looking for a first time tent to introduce the family to the delights of camping, then I would recommend this without hesitation. Why holiday makers want to stay at home? Should be left alone in the wild? Tent Voucher & Discount codes – caution!